So. Much. Rain. the last couple of weeks. Long dark days of rain and short violent storms with hail. My yard is littered with broken branches and my calendar littered with cancelled plans. “Where is Noah ? Is his ark about to pass by?” I would tease my coworkers as we looked out my office window. But what I was really looking for was a rainbow. Don’t we all? Looking for Some beauty after the pain. Some hope after the rain. and then. it. 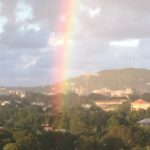 happened…on our drive to dinner last night, we drove through the middle of a perfect rainbow. Glorious colors: red, orange, yellow, green, blue indigo and violet on either side of a giant arch. We literally drove through the middle of a breathtakingly glorious rainbow. My sister Liese calls this a “kiss from God”. A reminder. A Promise from our creator that Joy does come after times of drought and after long nights of doubt. I am Here. I am here in the rain. I am here in your pain. I began singing the chorus of a poem I wrote years before after catching my breath once we passed under the long awaited bow. 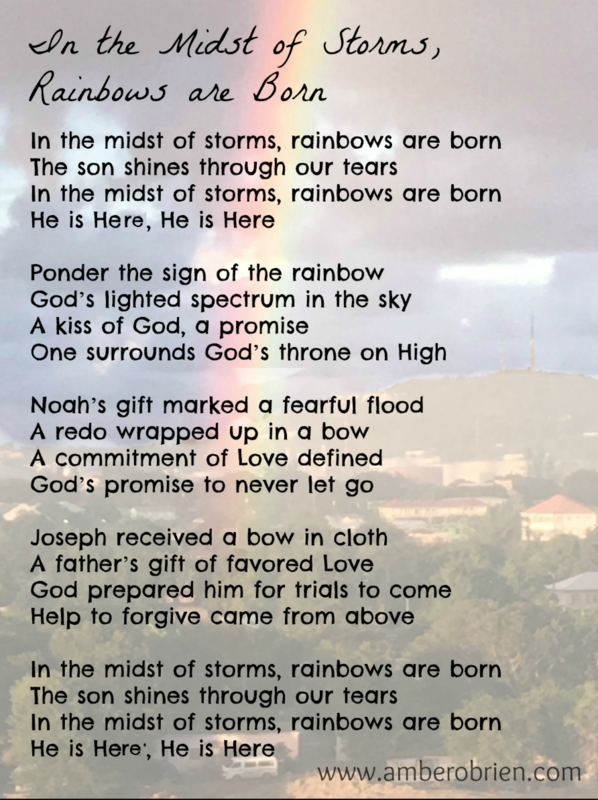 In the midst of Storms, Rainbows are born He is here, He is Here. God has new gifts and surprises ahead for you too. Author amberobrienPosted on July 31, 2018 August 1, 2018 Categories UncategorizedTags Look for the sun. 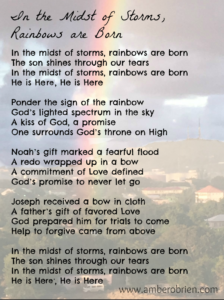 storms, Noah, rain, RainbowsLeave a comment on Where are the rainbows?